The Carolinian Retirement Community recognizes that we each have our own individual needs; therefore, we each need to be given individual care. At The Carolinian Retirement Community, we are dedicated to improving the quality of life for each of our residents. We want our residents to feel confident to enjoy the things that they once thought wouldn’t be possible again. Through monitoring our residents’ health and well-being our professional staff learns the needs of each resident. They learn not only what care is needed but WHO our residents are as individuals. 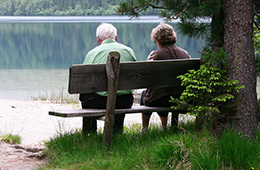 With that information, we are able to assist our residents in achieving their goals and enjoying life to the fullest. Seeing them enjoy improved health and fitness, new friendships, going on outings and trying new activities is what truly inspires our staff to deliver the respect and quality of care each of our residents deserve. The Carolinian Retirement Community provides oversight and assists with bathing, dressing, and medication administration as needed. Assisted Living is designed to encourage our residents to be as independent as possible. Having onsite staff provides opportunities for assistance any time of day the need for assistance arises. At The Carolinian Retirement Community we want our residents to feel at home. We offer studio and one bedroom apartment home floor plans in assisted living.